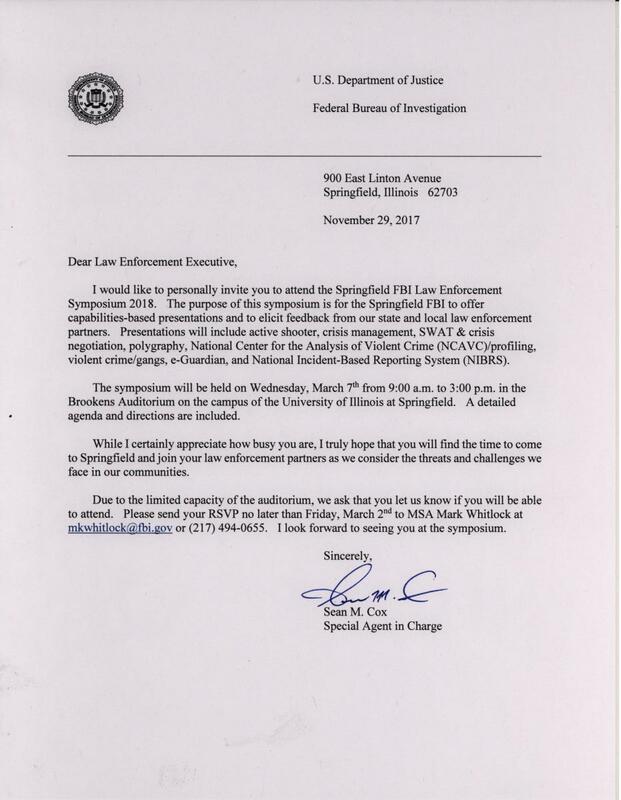 Sean M. Cox, the FBI Special Agent in Charge of the Springfield Office of the FBI, has invited law enforcement professionals to a symposium in Springfield on March 7, 2018. The purpose of the symposium is for the Springfield FBI to offer capabilities-based presentations and to elicit feedback from our state and local law enforcement partners. Presentations will include active shooter, crisis management, SWAT & crisis negotiation, polygraphy, National Center for the Analysis of Violent Crime (NCAVC) / profiling, violent crime / gangs, e-Guardian, and National Incident-Based Reporting System (NIBRS). There is limited seating so please register by contacting Mark Whitlock at mkwhitlock@fbi.gov. For more details, see the invitation letter here.